Bonus #1: The Reform Your Inner Mean Girl Transformation Jumpstart Video Workshop – Jumpstart your transformation with us! In this entertaining and transformational experience, led by us, Amy & Christine, we will walk with you sister to sister, and you’ll be part of a powerful global circle as you begin your transformation process. Bonus #2: The Inner Wisdom Kit – Receive videos, meditations, visualizations, worksheets, interviews and more to super power your transformation. A multi-media downloadable kit that includes so much, including videos on how to illustrate your Inner Mean Girl, meditations that help you find calm within the chaos of Inner Mean Girl attacks, and visualizations that attune you to the guidance of your Inner Wisdom and find the right job for your Inner Mean Girl. Bonus #3: Immediate access to the Inner Mean Girl Archetypes, Quiz & First Three Chapters– find out what type of Inner Mean Girl you have today! 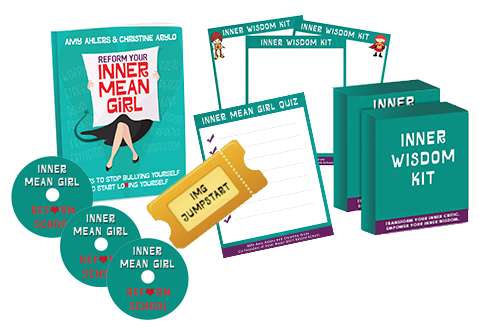 As soon as you buy your book, we’ll send you a full assessment which includes descriptions of all 13 types of Inner Mean Girls, including her toxic habits, big fat lies and weapons, and a quiz to help you identify which one is running you. my FREE BONUS Transformation Jumpstart video & my Wisdom Kit. Receive your bonus gifts – yippee!